I was invited to speak at The Spiritual Centre in Diep River (Cape Town, South Africa) last week about mindfulness for children. During the evening I had a conversation with a lovely elderly lady who gave me inspiration for the lessons for this week – thanks Isabel! She spoke about how much she enjoyed looking through a kaleidoscope as child. How the colours and patterns can be mesmerising, drawing one into the moment, to be completely absorbed by the reflections of the prism. 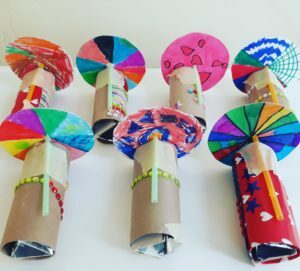 It struck me that this would be the perfect mindful art activity for the classes this week and it would fit in perfectly with the theme for the week – Creativity is Key. At the start of each class, I rang the chimes and we did our breath awareness exercises. I asked the children to listen out for the sound of the chimes during the lesson and when they heard it, I invited them to pause whatever they were doing, to close their eyes and take a deep breath in and out, and to bring their awareness to their breath. Wow! It was fantastic. I rang the chimes about 3 – 4 times during each 45min lesson and each time, it was like a reset button that helped the children bring their awareness back to themselves and the task they were busy with. I would recommend this activity to all teachers as a peaceful way to help children bring their focus and awareness back to the task at hand. We spoke about some famous people who allowed their imaginations to see beyond what was known at the time and in doing so, they invented and created exceptional things. Leonardo Da Vinci and the Mona Lisa. The Wright Brothers and the first flying machine. Alexander Graham Bell and the first telephone. Stephanie Kwolek and kevlar which is a lightweight, durable fabric used in many things from bulletproof vests to fibre-optic cables. And the children’s favourite inventor, Ruth Wakefield, who invented the choc chip cookie! I asked the children what they would invented if they could if they could make anything in the world. Incredible answers ranged from everlasting ice-cream to cars with special electromagnetic fields that caused them to repel if they got too close to other objects (meaning that no-one would ever crash again). Some wonderful, wonderful inventions coming our way! It was then time to make our kaleidoscopes. The children were all super excited and this activity really appealed to them. I encourage other mindfulness teachers to try it since it was quite easy and the kids loved it! I gave each child an empty toilet roll holder. They started off by decorating their holder while I finished up making each of them a tinfoil prism. To make the child-friendly prism without using mirrors, simply cut three pieces of cardboard of equal size that can fit into the holder. Cover one side of each piece of cardboard with tinfoil and then assemble into a prism shape using sticky tape. I would recommend making most of the prisms beforehand as it does take a little bit of time. Once the children had finished decorating their toilet roll holders, they inserted the prism into the holder. I then gave them each a circular piece of white cardboard with a hole in the centre. I encouraged them to colour all the white on the cardboard with patterns and bright colours. Each child then inserted a straw into the centre hole and stuck the straw into the toilet roll holder. And hey presto, kaleidoscope complete! The classes this week were a beautiful balance of creative energy flowing and doing its thing but checking in with the breath and self from time to time on hearing the sound of the chimes. Wonderful stuff.